En este sitio se reunio, el 16 de septiembre de 1810, el primer nucleo de insurgentes, convocado por el Señor D. Miguel Hidalgo y Costilla Cura de esta parroquia, para iniciar el movimiento popular que nos dio la independencia. On this site, on September 16, 1810, the first core group of insurgents were convened by Miguel Hidalgo y Costilla, the parish priest, to initiate the popular movement that gave us independence. Erected 1947 by Secretaria de la Defensa Nacional. Location. 21° 9.462′ N, 100° 56.06′ W. Marker is in Dolores Hidalgo, Guanajuato, in Municipality of Dolores Hidalgo. Marker is on Guanajuato just west of Principal, on the left when traveling west. Touch for map. The marker is in the northern portion of the central park (zócalo) of Dolores Hidalgo. Marker is in this post office area: Dolores Hidalgo, Guanajuato 37800, Mexico. Touch for directions. The marker can be seen on the left in this view towards the west. On the right in the distance is the Museo del Bicentenario (The Bicentennial Museum). this marker. 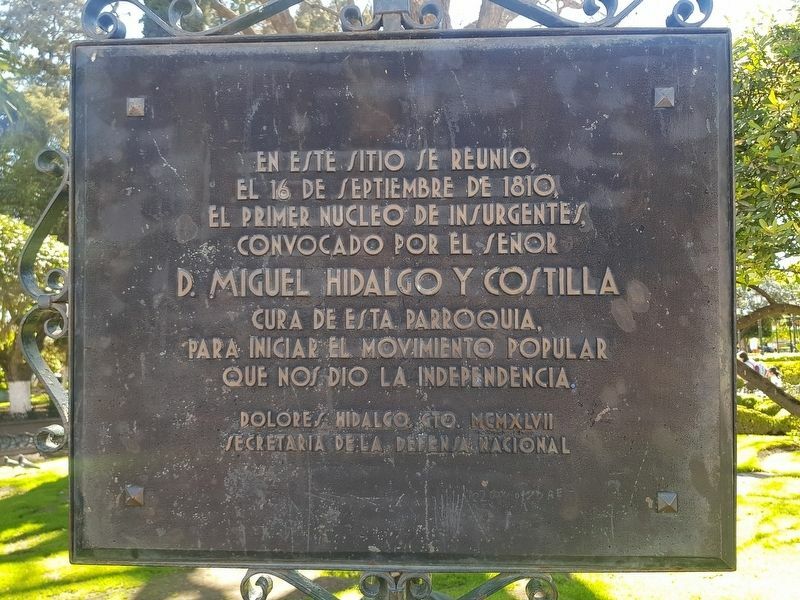 The Decrees of Benito Juárez in Dolores Hidalgo (a few steps from this marker); Hidalgo Memorial and Independence Garden (within shouting distance of this marker); House of Mariano Abasolo (within shouting distance of this marker); Miguel Hidalgo (within shouting distance of this marker); The Route of Hidalgo (within shouting distance of this marker); Cocomacán (within shouting distance of this marker); Casa de Visitas (within shouting distance of this marker); From Here Hidalgo Proclaimed Mexican Independence (within shouting distance of this marker). Touch for a list and map of all markers in Dolores Hidalgo. More. Search the internet for Miguel Hidalgo and the First Insurgents. Credits. This page was last revised on March 21, 2019. This page originally submitted on March 21, 2019, by J. Makali Bruton of Querétaro, Mexico. This page has been viewed 35 times since then. 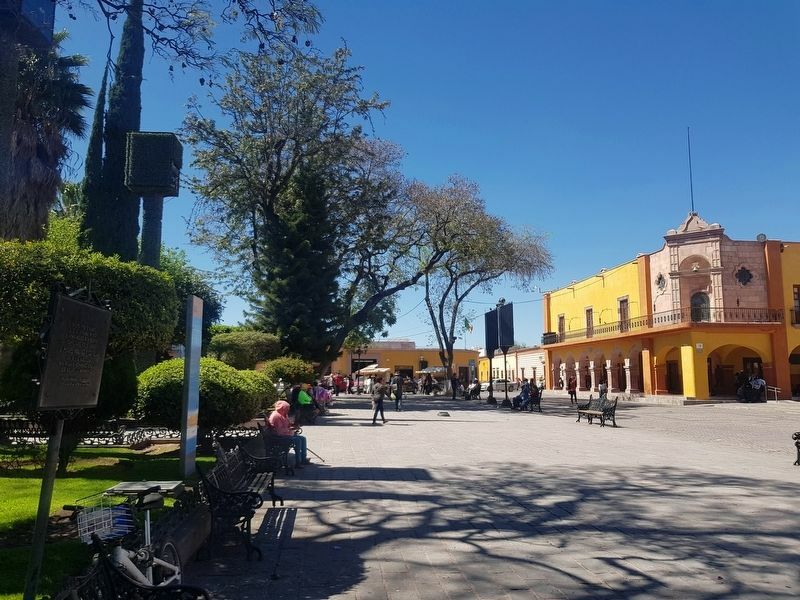 Photos: 1, 2. submitted on March 21, 2019, by J. Makali Bruton of Querétaro, Mexico.